You know how we’re all trying our damn hardest to get bodies like celebrities – drooling over Jessica Alba’s amazing bikini body or hoping one day we can wear a dress which makes us look in anyway like a movie star – well I think it might actually be possible now. Barry’s Bootcamp has officially touched down in London. Hailing from the US, it has celebs like Kim Kardashian, Jake Gyllenhaal and Jessica Alba herself on their client list.Need I say more…? Now, if you know me you know I like a challenge, and well okay the hot men on the website enticed me to see what all the fuss was about. So luckily I got myself a space on one of their opening weekend classes. And even though I was keen to go I really didn’t know what to expect. But as I arrived I loved the vibe – super friendly, encouraging and a nice splash of American positivity- exactly what London needs in dreary January. But then I actually had to do the class! Along with around 15 other scared looking faces we jumped on the tread mills where Noah, our trainer, made us go from your normal running to full out sprinting – high intensity training at its hardest. After around 15 minutes of fun on the treadmill we went down to our boxes and along with weights did a series of lunges, lifts and sit ups – until we were physically worn out. Then, we had to repeat it all again….. 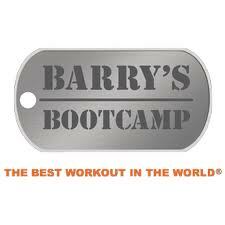 But after another set off treadmill intervals and my last weight sessions I left feeling a little bit smug – I’d actually completed my first Barry’s Bootcamp (without passing out!) and if I kept it up maybe I’d even get that bikini body I’ve always wanted…. So if you’re New Years resolutions have disappeared altogether – get yourself to Barry’s Bootcamp sharpish. Just don’t blame me if you ache the next day. I have waited in anticipation for Barrys Bootcamp to open – but when push came to shove, I chickened out this weekend! I wanted to know exactly WHAT I was in for before I jumped in to a class – so thank you for your review. It sounds…exhilarating. I now can't wait to try it!